Over time, the evolution of technological innovations has certainly turned the tides of achieving various tasks. Likewise, aside from simplifying work process, technological innovation has become a means of achieving what couldn’t be achieved decades ago. And a good example of this is the android data recovery ability of the iSkysoft toolbox. Considering the rate at which people losses vital data from their Android phones, one would say this application arrived in the nick of time. And unfortunately for some, lost data from their Android devices happens to be such that is vital and can be detrimental to them in some ways. 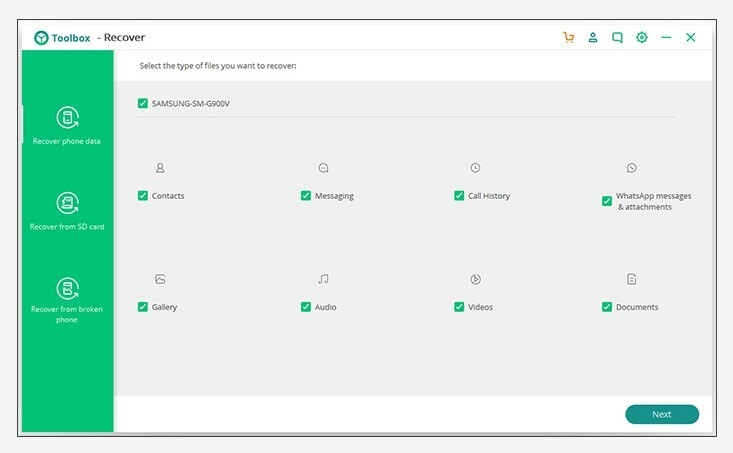 Nonetheless, the iSkysoft application is here to make sure android users don’t have to go through hell when any relevant data get lost on their gadgets. For instance, one can easily recover deleted text messages in android phones with this tool. However, when talking about data recovery with iSkysoft, it goes beyond recovering deleted SMS alone. It possesses the capacity to recover WhatsApp messages among others. Nonetheless, here is the full list of data recovery capacity of the Toolbox. The iSkysoft toolbox does outstanding work in the recovery of the above-listed categories of android data. However, it’s still possible for some to say ‘I don’t need the application because I’m always careful with my phone data’. But do you know there are other situations beyond one’s direct action that can lead to data loss from your phone? Aside from accidental deletion of files from phones, little do some know that phone data can be lost through the followings? Similarly, rooting error due to inexperienced hands trying to root an android or phone glitch among others often causes data loss of android phones. 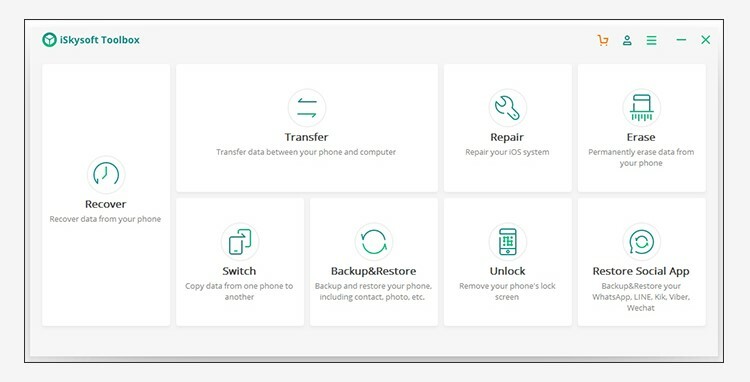 However, the emergence of the iSkysoft Toolbox, without doubt, has brought about the ideal solution to the issue of android data recovery. Considering the simplicity but yet effective solution desired by end-users of certain product or service, the inventor of this application put extra effort to make sure it comes as a user-friendly tool. The tool’s user-friendly features offer three simplified and effective steps in recovering back lost data. And the stages are as follows. Select the type of data you want to to recover (As you can see, the options are well laid out below). 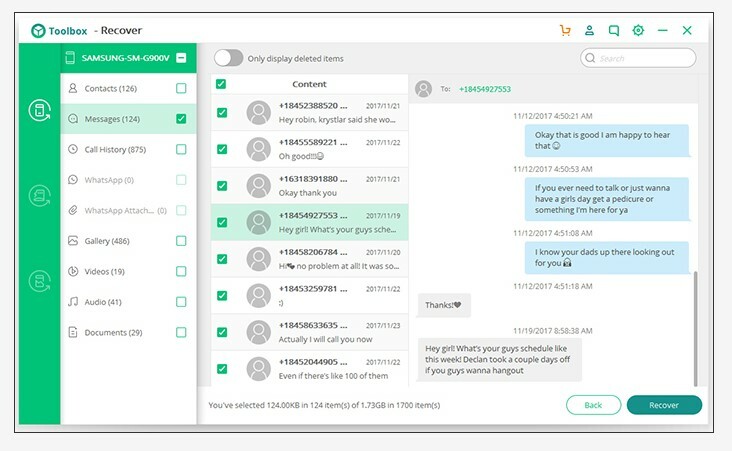 For instance, you have the option to recover deleted text messages android or select multiple sections of the phone to retrieve the data from. Then move to the next stage to start scanning. Here, you have the opportunity to preview your Android phone data on the computer screen. You then have the option of recovering the data to the computer or back to the phone. Then put the “Recover” button to initiate the completion of the recovery process. You would agree that there are some situations where data couldn’t be retrieved from the above aspect. However, the triple-combo ability of the iSkysoft Toolbox gives an enhanced possibility in accessing your confined data from your android. Nonetheless, to get an optimal result from the use of this tool, you must ensure that the data recovery process is initiated not long after your data is missing. Likewise, if you happen to be somewhere you couldn’t access your computer to initiate the process, you will need to limit the operation you perform with the phone. For instance, avoid running other apps when it’s not necessary or switch the phone off. This is just to give you the best chance of getting your data back intact. It’s possible you have been wondering if this recovery tool supports all types of phones. Right? It presently does not support any other type of phones which are not Android-based phones. However, the good news is that a larger percentage of people now use Android phones and new people are joining the list daily. Likewise, the application’s supported operating system includes windows, Vista, XP and Android operating systems. So, whichever of these operating systems you have, mean you are good to go with the iSkysoft data recovery toolbox. 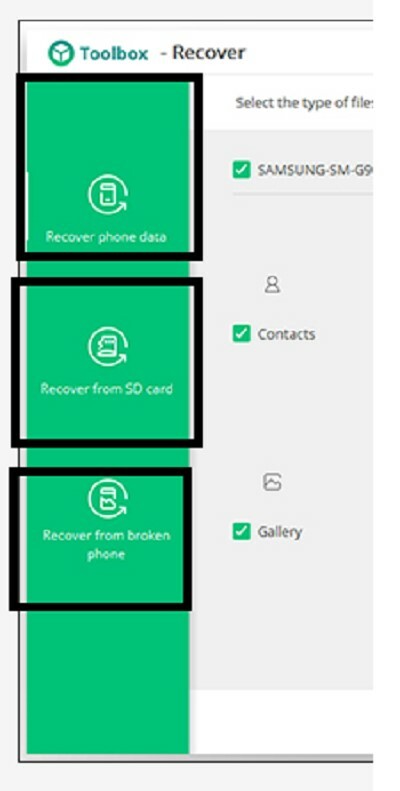 From the brief illumination of this android data recovery application, it is obvious that the time to be scared of lost data from your mobile phone is passed. So, why not take your time to check out more detailed information on how to optimally use the iSkysoft Toolbox application? It’s certain every android user will love this tool on the first trial. So, spare a moment to access the life-changing benefits this application offers practically today.